A critically acclaimed, fact-based drama and recipient of five Golden Globe nominations, The Imitation Game explores the life of mathematician Alan Turing, the man who went on to break the Enigma machine during World War II. 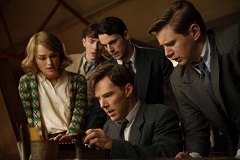 Summoned to Bletchley Park at the height of the war, the immensely intelligent but aloof and difficult Turing establishes a team to help crack the notorious machine, which lies at the heart of all Nazi communications. 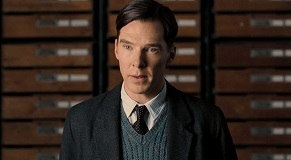 Featuring a terrific central performance from Benedict Cumberbatch, the film jumps between Turing's time at Bletchley, his earlier childhood and eventual persecution for homosexuality after the war, building an engrossing portrait of a man who was as enigmatic as the machine he was tasked with defeating. 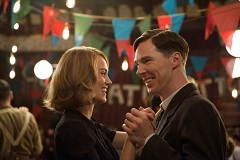 The Imitation Game is also the fourth of five films to be scored by the ubiquitous Alexandre Desplat – himself one of the Golden Globe nominees – during 2014 (the others being fellow WWII movies The Monuments Men and Unbroken, The Grand Budapest Hotel and Godzilla). Impressively composed in just three weeks, it's another triumph for the French musician who with each successive score further solidifies his position as one of the greatest film composers of the modern age. 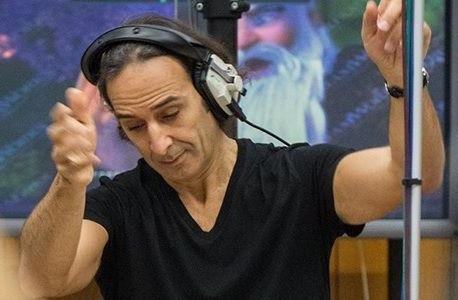 Desplat's music is famous for its intellectual qualities, often showcasing bubbling little motifs and ideas that endlessly percolate like thought processes in the mind – so he's therefore the ideal candidate to musically depict the complex Turing. However, it's Desplat's fusion of his intellectual and compassionate sides that really impresses in The Imitation Game, the composer reflecting both Turing's analytical skill and also his importance as one of the great heroes of the war. This becomes immediately apparent in the opening track, "The Imitation Game", a cerebral, rolling piano soon giving way to a lush, moving string accompaniment. Already, Desplat is constructing a portrait of a multi-faceted individual whilst also foreshadowing the eventual tragedy of Turing's story, a tactic that continues throughout the score. In the much darker "Enigma", the piano is reduced to a few tinkling notes over a bed of discordant strings, before pizzicati and booming timpani then build to represent the looming threat of Nazi Germany. "Alan" reinstates Desplat's lovely main theme with resonant work from piano and mournful counterpoint from the woodwind section, the shimmering, ever-present orchestration a welcome reminder of the composer's style. "U-Boat" changes tack again, a Jerry Goldsmith-esque rumbling piano accompanied by woodblocks and other percussive devices to depict the implacable forces of the Nazis. "Carrots and Peas" is another somewhat desolate cue, the strained strings and lonely piano of Alan's theme giving a sense of humanity under duress. "Mission" reinstates his theme in a nobler guise, the strings attaining a wonderfully inspirational quality. "Crosswords" starts with Desplat's familiar emphasis on delicate glockenspiels and chimes before adding on flighty woodwinds and strings for additional emotional resonance. Desplat's characteristic attention to detail in the way that various aspects of the orchestra continually play off each other never ceases to impress; it's endlessly hypnotic. The pensive, plucked strings and desolate glockenspiel of "Night Research" give a sense of time ticking away as Turing strives to crack Enigma and help win the war. By contrast, the strings heard in "Joan" have a much more purposeful, strident air to them, and are accompanied by a lovely, airy woodwind section. The moving "Alone With Numbers" initially reduces the main theme to a haunting piano solo, hinting at Turing's inner turmoil as we begin to discover the sheltered aspects of his private life, before the piano is picked up and fleshed out by other parts of the orchestra. "The Machine Christopher" changes tack again, attaining a precise, mathematical quality with a host of pizzicato strings, insistent piano and undulating glockenspiels, giving a suitably cold, robotic quality as Turing realises he must build one machine in order to crack another. "Running" steadily reinstates Alan's theme via the beautiful power of the strings whilst "The Headmaster" again takes things in a more mournful direction, benefiting from a gorgeous woodwind solo early on. "Decrypting" is another terse moment of rhythmic action, the rolling piano underpinning chopping strings that scurry and dart around in spellbinding fashion. The track is one of many that calls to mind the legacy of Jerry Goldsmith: although the styles of the two composers are very different, the urgency and tension Desplat creates hearkens back to Goldsmith's visceral mastery of the orchestra. "A Different Equation" begins as one of the score's darkest moments, before the strings subtly, palpably begin to shimmer with a sense of hope at the halfway point. "Becoming a Spy" the longest track on the album, offers dour, insistently rhythmic strings with sparse piano added for a humanising element. The loneliness evoked in "The Apple" and "Farewell to Christopher" is really quite haunting, giving the sense of a brilliant yet isolated mind, the piano and low strings in both building to moving performances with additional input from a heartrending clarinet solo in the former. "End of War", as the title suggests, restores a flowing sense of optimistic beauty via the ever-present piano, yet it's constantly tinged with a sense of melancholy that befits Turing's story. Still, Desplat saves the best for last with the subdued "Because of You" giving way to the uplifting "Alan Turing's Legacy", which reinstates the main theme to glorious effect. 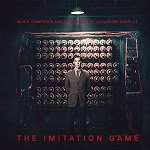 As mentioned, The Imitation Game is among five scores that Desplat has composed during 2014, each of which are different, yet each of which are immediately identifiable as the composer's. From the rampaging (Godzilla) to the nostalgic (The Monuments Men), the quirky (The Grand Budapest Hotel) to the elegiac (Unbroken), it's been an outstanding year for one of the most creative and exciting voices in modern film music. It's to The Imitation Game's credit that it stands proud and distinctive alongside all those other aforementioned scores. There's a vivid sense that Desplat got to know Turing's character intimately, knowledge that allowed him to depict the man's triumphs and complexities with his characteristic musical intelligence. There's a sense of sadness pervading the score that's achingly moving, yet even the most poignant moments shine through with genuine compassion, offset against which are the darker, more complex textures depicting Enigma and the spectre of World War II itself. Consistently engaging and thought-provoking, Desplat's music is well-deserving of its Golden Globe and Oscar nominations. The score album is available on CD, on Vinyl, or as an MP3 download at these links: Amazon.co.uk or Amazon.com.